Midcentury-modern beach houses, their jaunty, angled forms clad in weathered cedar siding, have faced tear-down threats for two decades now. The archives of their architects, however, are sometimes enjoying better fates. 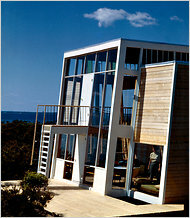 This 1961 image of Andrew Geller's Frank House in Fire Island Pines, on Long Island, was recently rediscovered. Two scholars are sorting through faded color slides, rolled blueprints and musty photo albums related to low-slung houses perched on dunes. Christopher Rawlins, an architect in Manhattan, is poring over the papers of the architect Horace Gifford, best known for catering to Fire Island clients as prominent as Calvin Klein. Gifford died of AIDS in 1992, at 59, and an artist friend, Ed Di Guardia, had long stored the files in his Long Island garage. Jake Gorst, a documentary filmmaker, has moved into an 1890s Long Island home in Northport, where the architect Andrew Geller, his grandfather, spent a career playing with geometries. Mr. Geller’s most famous work is being preserved: the Pearlroth House in Westhampton Beach, N.Y., with two diamond-shaped wings often said to resemble a bra. Mr. Geller, 87, is in poor health and lives with his daughter, Jamie Geller Dutra, in upstate New York. Mr. Gorst; his wife, Tracey; and their two daughters have preserved the attic office, down to the tobacco-smoke stains on the wood ceiling and racks of tweed jackets, protractors and T-squares. Drawings and models keep turning up in closets and crannies. “I feel like I’m on a treasure hunt in my own house,” Mr. Gorst said. But storing aging paperwork and cardboard models safely, and preparing for exhibitions, books and documentaries, can be costly. Mr. Rawlins runs a Web site, horacegifford.org, and hopes to raise $70,000 for a Gifford monograph from Princeton Architectural Press. Mr. Gorst’s Web site, andrewgeller.net, links to his kickstarter.com campaign, trying to bring in $40,000 for archive preservation by June 2. The beach house architects did not prepare much for scholarly attention. Gifford, who suffered from manic depression, gave away many of his models and did not record street addresses on his vellum drawings. “I love Horace Gifford, but occasionally I curse his habits,” Mr. Rawlins said.